Al portal de casa_ i els constructors_ is a project by Jordi Canudas, which was developed initially in Vic, and which more recently was brought to Mataró. In Vic the project's methodology was set up, specified and tested, together with the school La Sínia within the context of El Remei, the district in which Jordi Canudas had once lived. In Mataro, the methodology grew and expanded, and was put into practice within contexts which were unfamiliar to the artist, areas in which he was a visitor; the districts of Pla de Boet, Havana and Rocafonda. 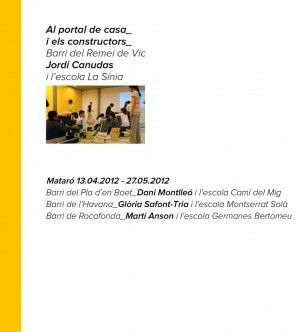 In the first case, he chose the site on account of his relationship and personal experience with Vic, while in Mataro, the sites were chosen based upon the artists invited to participate, Dani Montlleó, Gloria Safont-Tria and Martí Anson. These sites were the districts where they were born, in which they grew up or lived; and the project was developed jointly with three schools, each with its catchment area in one of the chosen districts, El Camí del Mig, Montserrat Solà and Germanes Bertomeu. This is another of the strengths of this project, the ability to involve new teachers, new students, new artists, new districts and new institutions in a collaboration in which all links are clearly local. Mataró Town Council, through Can Palauet, served as the promoter of the project.